The Mosaic Rooms, a non-profit gallery aiming to promote art from and about the Arab world, showcases the work of Basma Alsharif, a Kuwait-born artist and filmmaker of Palestinian descent, who is currently based in Los Angeles. Alsharif’s video installations have been presented in major exhibitions, such as the Whitney Biennial, les Rencontres d’Arles and The Berlin Documentary Forum. The Gap Between Us is her first solo exhibition in the UK, bringing together three of her installations, including her first feature length film Ouroboros (2017). Alsharif’s work experiments with the aesthetic configurations of space and time, and explores the notions of witness and presence through the recurring theme of Palestine. The exhibition starts with Alsharif’s 2009 film We Began By Measuring Distance, which was awarded a jury prize at the ninth Sharjah Biennial. A common theme in Alsharif’s films seems to be people’s relationship to the space they inhabit, and this idea becomes especially crucial to this installation and the way the filmmaker experiments with images of landscapes and people continuously emerging from and blending into each other. Moreover, as an artist who has been raised and lived in various countries, Alsharif relates the experience of being an artist in diaspora with the conception of this film, and states that this film arose from the frustration of witnessing the tragedies in Palestine from a distance for a very long time. Consequently, the most striking moments in We Began By Measuring Distance are the ones that self-consciously reflect on the physicality of ‘space’. From early on in the film, the viewer is presented with photographs of desert landscapes in a book, contrasted with a still frame of people waiting, titled ‘BOREDOM’. The relationship between the two visuals highlight a sense of absence; the inactivity of the people is paralleled by the vast desert landscapes, and therefore their emptiness is defined almost as ‘gaps’ within time and space. Similarly, the way the viewer is introduced to ‘a game of measurements’ elaborates on the same theme, and situates it explicitly within the Palestinian context. A long white sheet is brought forward in the frame, held by two people in the middle of a field. The sheet itself seems to hint at the ‘gap’ between the two people as distance measurements between cities such as Rome, Geneva, Gaza and Jerusalem begin to appear on the sheet. Nonetheless, as the distance between Gaza and Jerusalem gradually shrinks and the numbers eventually morph into significant dates involving the Palestinian-Israeli conflict, the viewer begins to realise how the abstractness of numbers and dates themselves create distance and discrepancy between the way we perceive historical narratives and physically experience the reality of an historical event. Moreover, in the last scene, as Alsharif focuses on a woman, using slow motion to accentuate the ambiguity of her changing facial expressions in reaction to a scene of violence in the distance, she ultimately questions what it means to inhabit the ‘gap’ between two points or settings, where full presence within a moment is almost always deferred or rendered impossible. Alsharif’s second installation High Noon (2014) in the downstairs gallery greatly differs from the first film. 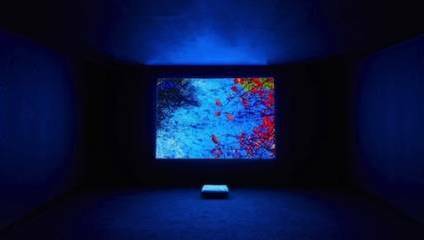 Entering the dark room, the viewer is immersed into a dizzying experience of sound, colour and movement. Colour saturated photographic stills of Californian landscapes are displayed together with those of Onomichi, Japan, and are lit with neon lights from the ground. In the background, a looped electro soundtrack accompanies the video projected opposite the photographic stills, and the repetition of footage along with circular camera movements create a hypnotic moment making it impossible to look away from the projection. The simultaneous presentation of the two different settings in both the video and the stills creates a sense of multiplicity - existing in multiple places at the same time. Differing from the previous installation, High Noon distorts the understanding of space and time through the use of intense colour, where it eventually becomes difficult to differentiate the two landscapes. Lastly, the longest piece in the exhibition, Ouroboros, takes its name from the ancient Egyptian symbol of the serpent eating its tail, denoting the endless cycle of destruction and re-creation in nature. Although the film follows a cyclical pattern beginning with dawn and moving onto noon, dusk, night and then dawn again, this temporal frame is contrasted with the loosely connected and fragmentary scenes, which deliberately refrain from creating a coherent narrative. Perhaps the most interesting moments in the film are the scenes where we see how the main character’s actions are reversed, creating a tension between his ‘backward’ movements and the progressing narrative. Similar to We Began By Measuring Distance, this film seems to question the notion of presence and the impact it has on physical space, the strange rhythm and atmosphere created by these movements and interactions reminiscent of Elia Suleiman’s 2003 film Divine Intervention. As Alsharif further highlights the silence behind these movements within both domestic and external spaces, the constant deferral of a sense of finality creates an overarching feeling of melancholy throughout the film. Alsharif’s work is surprising, fresh and profound. The Gap Between Us is a thoroughly impressive exhibition, and a must-see for anyone interested in a powerful sensory experience. Keep your eyes peeled for her future work.